“I think gun control proponents are misguided in trying to persuade others of their position in the way they usually go about it,” said Russell Moore, president of the Ethics and Religious Liberty Commission of the Southern Baptist Convention, in The Washington Post. Evangelical leaders have stronger feelings about addressing gun violence through legislation, according to a survey released by the National Association of Evangelicals (NAE) in August. Most denominational heads and ministry presidents surveyed own a firearm themselves, but 55 percent agreed gun laws should be stricter. I don’t think that any gun control measure that I’ve seen would be effective in addressing these issues. I hold to conservative views on the Second Amendment, but I don’t hold to my views here in the way that I would something clearly revealed in Scriptures. I certainly don’t hold to those things the way that I would the fundamentals of Christian doctrine and ethics, which is why I have very close co-laborers in Christ who are proponents of gun control. They haven’t persuaded me of that, but I don’t see them as being on another “side.” We both are looking toward the same goal. No, No, NO, NO and a thousand times NO!! We are NOT working towards the same goal and we are not on the same side. One side wants to enable people to perform their God-given duty of self defense and defense of loved ones, neighbors and family, and the other side wants to turn to the state, the usurper of God’s providence, for cradle-to-grave protection and security. I saw the ridiculous statement from the NAE (National Association of Evangelicals), which is anything but evangelical, when it first came out, and I thought it was so stupid that I didn’t bother with it. Ignore them. And carry a gun at all times. The U.S. Court of Appeals for the Third Circuit has ruled that a former Pennsylvania State Police firearms instructor who allegedly disregarded multiple safety measures and ultimately shot and killed a fellow trooper during training is not immune from a lawsuit brought by the deceased trooper’s mother. A three-judge panel consisting of Third Circuit Judges Cheryl Ann Krause and D. Michael Fisher, along with visiting Eighth Circuit Judge Michael J. Melloy, overturned an Eastern District of Pennsylvania judge’s ruling that former Cpl. Richard Schroeter was entitled to qualified immunity as a state employee. Joan Kedra, mother of Trooper David Kedra, sued Schroeter for civil rights violations under the state-created danger theory. According to Krause’s opinion, Schroeter skipped over several safety checks, included checking to see if the gun was loaded, aiming at a person instead of at a target, and then pulling the trigger. Okay. Very well. But I feel certain that this wasn’t … ahem … due to the fact that a cop died rather than a regular person like me. Right? So let’s see this same standard applied to every SWAT raid where a baby gets blown to bits from a flash-bang, for every wrong-home SWAT raid, for every trigger happy goober cop who pulls a gun on a motorist, and so on the list goes. You know, for those cases where someone other than a cop gets shot or dies. Finland’s Muslim population alone could increase by more than four times, while the UK could see an increase of 2.65 times in little more than a decade, according to projections made in the study. Around 6.3 per cent of the UK’s population is currently Muslim – compared to the percentage of 4.9 across Europe – with the country potentially reaching 17.2 per cent in the high migration scenario, to the Washington-based Pew Forum report suggested. Under the highest level projections, one in five people in Germany would be Muslim by 2050, Sweden is expected to see almost one in three. At least in the time of the Crusades, there was a Christian presence in Europe that bound the nation-states together enough to fight a defensive struggle against a common enemy. Today that exists no more. I recall asking a Dutch (who spoke English) about the legacy of Herman Bavinck and Abraham Kuyper. He had no idea who those men were. I am also good friends with someone who visited the home and former classroom of C.S. Lewis, and the guide told him that the only tourists interested in Lewis were now Americans. No one in England knew who Lewis was. You’re looking at the end of Europe. They want to resist, some of them, but they have no soul for it, no stomach, no foundation, no moral moorings. Combine that with the narcissistic world view which neglects to reproduce, while the Muslims reproduce like rabbits, and they will be Muslim within our lifetimes, and that by force. My biggest concern is that America isn’t far behind. Unless you do this sort of thing every day – and I don’t – it pays to rehearse some of the basics. These links are worth the study time today. And that, dear reader, is all you need to know. You don’t need to know that the formal definition of assault rifle includes selective fire. Assault rifles aren’t machine guns, or something. The most important thing you learn from this is that there is such a thing as the “single rifle.” In the author’s world, anyway. Perhaps we could get the author to drop by and tell us what that is. If it’s more powerful in its awesomeness than an assault rifle, by God I must have one. 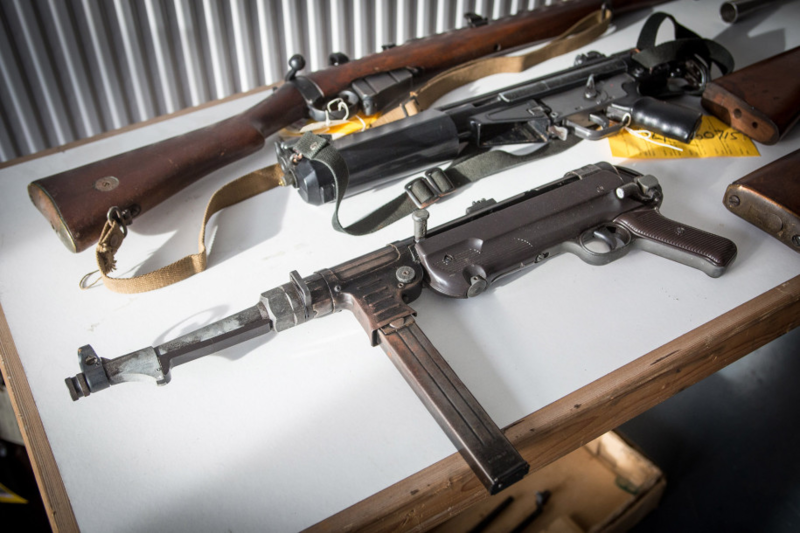 Officers say the prop German sub-machine gun was dropped at a police station by an unnamed male who worked in the film industry. He told cops the MP40 sub-machine gun was used by Eastwood in the movie while he was disguised as a Nazi. It was handed in at the Bridgwater Police Station in Somerset. In the UK, guns are highly regulated with handguns all but banned. Amnesties are regularly instigated by police wherein citizens can turn in illegal guns without facing penalties. Vise added that the majority of guns will be destroyed. I’m right here, others are here, but no, this idiot had to turn this in to the UK police to be destroyed. Or played with by them. Yea, I know. I’m right there with you buddy. Avoid, barricade, and whatever else. A few twists on the “run, hide and fight” claptrap dispensed by the DHS and there you have the CMPD advice. Police focused on tips like having an exit strategy and escape route planned. If you can’t immediately escape, barricade yourself in a room or turn off the lights to make the room look like it’s unoccupied. Police also said that if you’re within arms-reach of the shooter, attack them from the neck up, go for their eyes and try to jam their gun. Clergy members told Channel 9 that they’ll be working on putting together an action plan for emergencies. Many are also planning to secure their buildings by shoring up the doors and installing locks. For more information, call 704-336-2310 or email crimepreventionunit@cmpd.org. Not a word on anyone doing what they need to do, which is carry a weapon and be prepared to use it by spending time at the range. Not … a … word. Just wait until the super Ninja warriors get there to handle it. Perhaps only a few people will have perished at that point. Hey, CMPD, how will you handle it when scores of people perish inside a place of worship in Charlotte and you haven’t told them to be prepared to effect their own self defense? Are you okay with that? Oh, and I doubt your estimate of an average of five minutes to respond to an active shooter. Prove it? First of all, I realize that nurses do not swear the Hippocratic oath like doctors. Second, I do not believe in the concept of thought crimes. I don’t want such an idea ever applied to me, and I won’t apply it to her. Still, there is the notion of legal obligations and criminality that may have come from negligence or even intent, and so she should be investigated. She has the right to think what she wants, but she doesn’t have a right to act on it if that means violating laws against persons. Now that the individual has been addressed, think for a moment about how she got here. 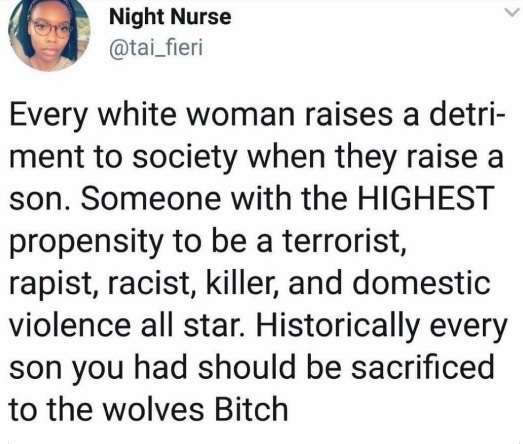 The society enabled her, perhaps even persuaded her and encouraged her to think this way, to blame all evil in her universe on the white patriarchy. Evil, problems, social ills, etc., are all a function not of individual choices she and her community makes, or of the moral conditions of the soul. They are always and forever a function of someone or something else. This is the condition wrought by modern education and the entitlement state. It isn’t just that it steals from you and your family. That would be bad enough, for we know from the Scriptures that the “Good man leaves an inheritance to his children’s children” (Proverbs 13:22), and how do you do that when much of your wealth goes to the state? It’s worse. In cases like these, she may have inflicted pain or maimed or even killed someone because of her attitude. Ponder this for a moment. If they tried any harder could they find a better way than things like this to foment a class war, race war, or culture war? One is tempted to conclude this is their intention, yes? Would you want loved ones to be treated by this girl or someone like her? How would you ever know if the nurse treating you is someone like her? You Mean He Didn’t Even Have An SBR In His Pants? An 18-year-old with an AR-15 rifle in his pants was among more than 20 people arrested for illegal gun possession as Thanksgiving and the Bayou Classic football game brought big crowds to the French Quarter over the long holiday weekend, the New Orleans Police Department said Monday. The NOPD made 19 gun arrests Friday and Saturday, and State Police added six of its own, including the arrest of a Bourbon Street bar security guard and bouncer who shocked another man with a stun gun while pretending to be a law enforcement officer. A group of undercover officers found the AR-15 on Saturday in the possession of Joseph Graham, of Baton Rouge. The cops stopped Graham after they said they saw him smoking marijuana near Canal and Bourbon streets. During the stop, they found that he somehow had managed to hide the rifle, which is a staple of the U.S. military, in his pants, Gernon said. Ah, I see that the law against SBRs (long guns with less than a 16″ barrel must be registered as SBRs with a background check, ATF approval and a $200 tax stamp) didn’t stop him from going ahead and concealing a carbine length barrel. Look at the picture. That’s not an SBR, it’s got a barrel of 16″ or greater. So much for the wisdom of Congress and the NFA. But we peaceable, law abiding gentlemen who want to have SBRs must continue to have the paperwork. Because 16″. It’s a magic number. Even though we could conceal a longer barrel. They didn’t stop him for a rifle. They stopped him for pot. CENTRAL TEXAS — A Killeen woman has shared disturbing video of an attempted burglary in an effort to warn other residents to be on alert and to keep the would-be thieves from targeting anyone else. The footage was captured on a Vivint home security system around 1:08 a.m. Nov. 18 in the 2200 block of Fieldstone Drive off of Willow Spring Road in Killeen. The victim said she heard glass break toward the front of her house. When she went into her living room, she realize someone had broken her window. So, she called 911. While the woman was on the phone with 911, a guy in a jersey knocked on her door and asked if she was okay. But, the woman claimed the male in the jersey was only a distraction to allow the other guys to approach with guns. She said the trio was going to rob her but saw she had four dogs and ran away. When police arrived, officers said they found the guy in the jersey in front of the house claiming to be a concerned neighbor. As the victim suspected, police later determined he was involved, so they arrested him. Investigators also located two suspicious vehicles nearby. They determined the occupants in the vehicles were the other suspects in the incident and arrested the occupants in both. In total, four adults were arrested and one juvenile was taken into custody. All five were charged with burglary of a habitation. The four adults were identified as Gjavion Smith-Williams, 17, Davieon Reed, 22, Jamal Marbury Jr., 18, and Daquan Lavant, 18. It brought a smile to my face to see the hoodlums run away in that video. Next up, news from Canada. It is an amazing tale of survival. Dog walker Annette Poitras spent more than two days lost in the backcountry of Eagle Mountain in Coquitlam with three dogs. They were all rescued alive and safe Wednesday afternoon, and now more details are coming to light about how they survived the rain and the elements. Marcel, Annette’s husband, told Global News on Thursday that the dogs helped his wife stay alive. “One of them was cuddling [her] and one of them was on guard and the other one was looking for food,” he said. Annette was with a collie named Chloe, a boxer named Roxy and a puggle named Bubba. They didn’t leave her side, even though one of them initially wandered off when Annette fell and hurt herself. But luckily, that dog came back and then all four of them stayed together until they were rescued. Despite having no water or food, it appears the group took care of each other as best they could. Annette also learned a survival tip from the dogs. I don’t think it was “lucky” that the one dog came back to her, but then, I don’t believe in luck or chance. I doubt that the dog who hunted for food came back with anything for her that could be eaten unprepared, but I also doubt that she had much of a chance for survival without the dogs. Got dogs? If you want companionship, faithful, loyal and loved family members, and committed partners for your protection, you can’t do any better than dogs.